If you are a populist your patriotism has given away to nationalism in today's politics. Under the current populist credo you have a right to make up your own "facts," and anyone who is an expert on something can be written off as being allied with the elite. Think America's Donald Trump, and England's Boris Johnson. The white working classes in America and England see big business, banks, and globalization as enemies to be treated with contempt. Populism is not simply a benign devotion to "the people." Populists are ultimately nationalists, and in nationalism you'll find the roots of many of the twentieth century's most terrifying events. Hitler's rise to power in Germany and the subsequent slaughter of millions of Jews happened under a nationalistic regime. When you talk about patriotism it's about the love of a particular land, with it's particular traditions. Nationalism is the love of something less tangible, of the myth of a "people," justifying many things, a political and ideological substitute for religion. Boris Johnson almost became England's next prime minister but fell victim to inner party politics. 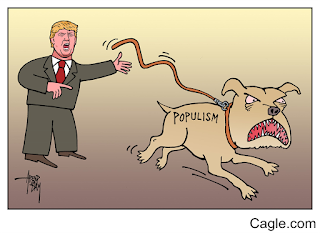 Trump has between now and November to sell his brand of populism/nationalism to the American public. For the sake of future generations of Americans, I hope Trump is trounced in the general election, and just becomes a nasty footnote in political history...much like Boris Johnson has become.